Save vs AutoSave: What is the Difference? You should regularly use the Save button in BlogPad Pro to save your posts as you write them, as the Auto-Save is there as a safety-mechanism in case something unexpected happens. For example, your iPad could run out of charge or perhaps (but hopefully not) the app crashes. Either way, the Auto-Save mechanism is designed to create a back-up onto your device of the most recent version of your post. NOTE: As with any digital document you may be working with, we recommend that you regularly save changes to your Post using the Save button. 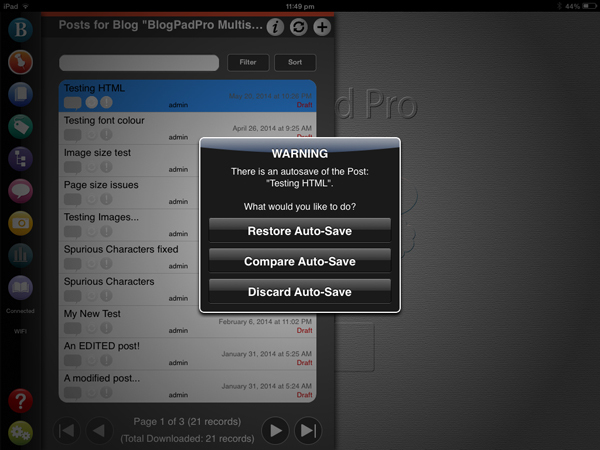 This is why BlogPad Pro reminds you of unsaved changes with a Visual Indicator above the Save button which says “Save Your Changes”. Auto-Save saves your post locally only on your device, and not to your blog. So, if you’re editing a published post the Auto-Save won’t change your published content, you have to manually tap the Save button for that to happen. 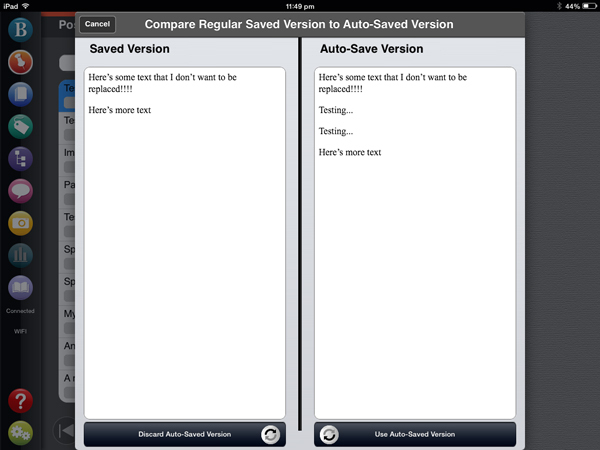 If you’re not sure what could have been in the Auto-Save, you can choose to compare the Auto-Save to the regularly saved version. You can then select which you want to keep. NOTE: When you choose either the “Restore” or “Discard” options above, the Auto-Saved data is cleared (so that you’re not prompted about that same data again). That means it can’t be retrieved once replaced. Where Can I Find Previous Versions of My Post? If you save your content regularly with the save button, and those changes are saved to your blog, (i.e. this won’t work if you’re working in offline mode) but you find yourself still wanting to revert to a previous “revision” of that Post you can still do this. With the current version of BlogPad Pro, it’s not “natively” possible to revert to other versions, but you can get the job done by using the Web Dashboard to select which version you want, then updating that post from Live. It’s very simple to take a screen grab (or screenshot) from your iPad. A screen grab allows you to take a photo of whatever is displayed on your iPad screen. The picture is then saved in your Camera Roll. Press and hold the menu button (the main circular button below the screen). While the menu button is held down, press the power/lock button (the switch on the top edge of the device). 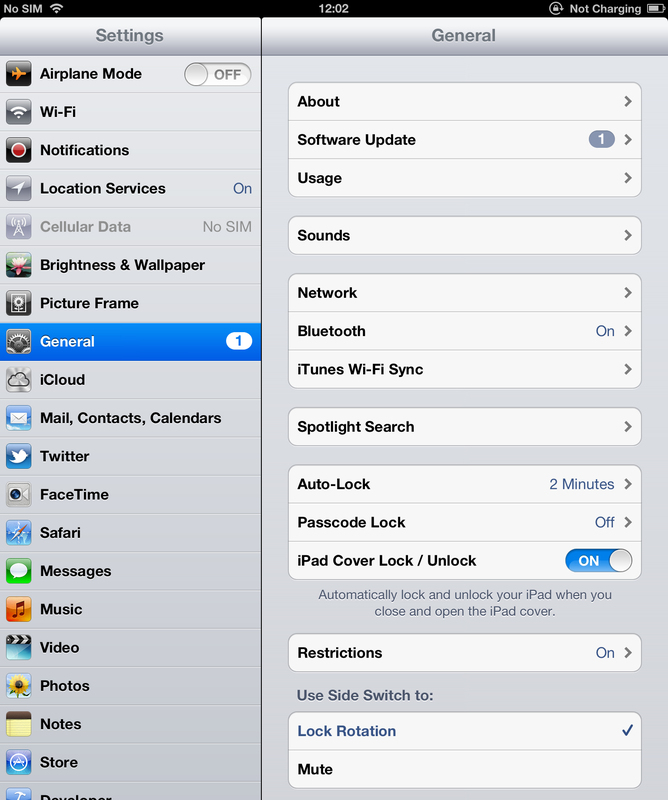 You can now see your screen grab picture in your iPad photos. This works on an iPad, iPhone or iPod Touch with IOS version 2.0 or higher. Tags are the lifeblood of your blog, they help other people to find your posts and provide a useful way of grouping your posts by topic. How do I know which tags to use? How many tags can I use? Do I have to re-type tags every time I use them? How do I manage my tags? No, you don’t have to use tags. However, they can be very useful so I would recommend using them. You can use as few or as many tags as you like on each post. Tags are words, rather like keywords, which help describe what your post is about. There are no hard and fast rules about this but basically categories are for a broad grouping and tags are more specific. For example if your blog is about food and your post is about lasagna, you would perhaps use the categories: Recipes, Pasta, Dinners and the tags: lasagna, tomato, beef, cheese. I use categories for organising my blog and tags for telling people what a post is about. A really common question is: How do I flick between open apps on my iPad? If you’re finding it a pain when you need to be looking at an open web page and editing your blog at the same time, you don’t need to keep pressing the home button to close one app and open another, you can flick between running apps with a horizontal four-finger swipe. Not working? You might need to enable multitasking gestures. Go to: Settings > General > Multitasking Gestures and make sure the toggle is set to ‘ON’. 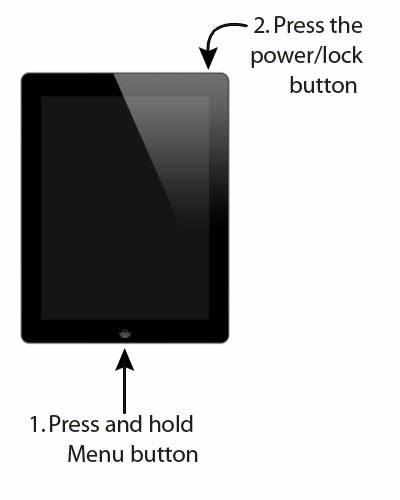 If you’re tired of your iPad screen rotating when you don’t want it to you can set the slide switch to lock the orientation of the screen. By default this is set to be a mute button but since you have the volume buttons right below it this maybe more useful for you. To do this tap on Settings > General > Use Side Switch to: Lock Rotation. How do I type special characters using my iPad on screen keyboard? Have you been wondering where to find the special characters on your iPad keyboard (those with accent, grave, cedilla or umlaut marks)? As with most Apple solutions it’s surprisingly easy when you know how. Simply press and hold the letter you want a variation of and the different special characters will pop up for you to choose. For example if you want é press and hold e.
If you need a capital put the caps lock on (double tap the shift key – the one with the arrow on it) and then press and hold your letter.